Jump in the Batmobile and get ready for a wild ride--this is a complete and in-depth look at the development of America's most popular super hero. From his vigilante days to his television stardom, from Dark Knight to mentor, this memorabilia- and anecdote-packed collection follows the masked man on his crime-fighting career, and charts the history of the comics and movies that bear his name. How can one man be at times so vengeful, compassionate, determined, inspirational, and a true hero when he doesn't possess special powers? Over the decades since his first appearance in the 1939, Batman and his alter-ego Bruce Wayne have thrilled readers with their adventures, close calls, dramatic storylines, and even death! Ultimately, the history of Batman is the history of America from the twentieth century to today. 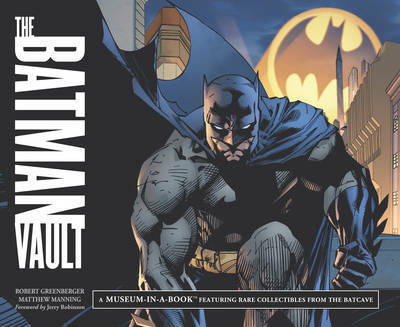 With removable artifacts and never-before-seen sketches, notes, and plans, The Batman Vault is the perfect gift for the genuine fan of all ages.